The University of New Mexico Athletic Training Education Program (UNM-ATEP) is dedicated to creating and maintaining an educational program that meets the standards and guidelines set forth by the following governing bodies: Board of Certification (BOC), Commission on Accreditation of Athletic Training Education (CAATE), National Athletic Trainers’ Association Executive Committee for Education (ECE). 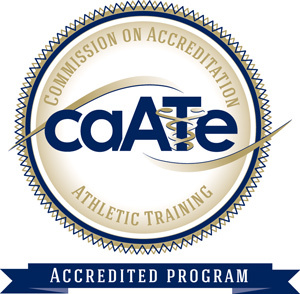 University of New Mexico Athletic Training Education Program (UNM-ATEP) is accredited by the Commission on Accreditation of Athletic Training Education (CAATE). *Information obtained from the Board of Certification Exam Reports. The mission is to provide exceptional education and prepare critical thinking professionals for a career in athletic training. Emphasis is placed upon developing skills in assessment, management, and scholarship to become life-long learners and effective healthcare providers. Graduates will provide leadership and service in society and deliver optimal healthcare. Demonstrate preparedness to enter the workforce as qualified healthcare providers. Demonstrate the skills necessary to provide optimal healthcare to diverse patient populations. Demonstrate positive leadership and professional skills with an adherence to ethical professional standards. Demonstrate a fundamental understanding and application of scholarship to enhance patient care. Demonstrate fundamental clinical skills and utilize best practices in patient care. Utilize self-assessment as a life-long learning tool to enhance professional development. Demonstrate a commitment to service in the community. Identify emergency situations / conditions and demonstrate appropriate care. Demonstrate a full evaluation and provide a diagnosis for athletic injuries. Fit appropriate equipment / braces and apply prophylactic tapings. Select appropriate therapeutic modalities to affect and treat athletic injuries. Create rehabilitation / reconditioning plan(s) for the injured patient athlete. Document injuries / illnesses, treatments and rehabilitations for patient / athlete. Create and implement an Emergency Action Plan. Present a research topic to peers and other professionals. Differentiate between musculoskeletal injuries / conditions. Design and implement medical personnel coverage protocols for athletic events.